The APPI Pilates Flow with the Soft Ball online DVD is ideal for improvers, and covers dynamic and rhythmic standing, along with mat-based Pilates. The sequences taught in this class flow with control and precision to improve stability, body awareness, ease of movement, and body confidence. This APPI Intermediate Mat with the Pilates Weighted Balls Online DVD helps to target your inner core with the use of Pilates weighted balls. Learn variations, progressions, and twists to improve strength, stability, control, body awareness, and balance. 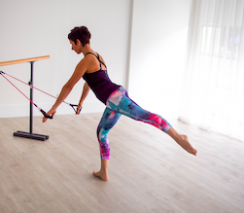 A perfect addition to your client's home exercise programme for rehab or fitness, this repertoire of exercises can be performed anywhere there is room for a mat and a secure place to attach a resistance band.